Chicken nuggets, a food scientist's invention first sold in 1980, are a gargantuan American industrial-foods sales success far beyond the initial imaginations of even fake-food corporate executives. Billions of chicken nuggets have been sold in every U.S. supermarket, served in all family-style restaurants, and are essentials on fast-food menus. First and foremost, chicken nuggets are widely seen as healthier kid-friendly options than greasy cheeseburgers in spongy white-bread buns. Nuggets are purposely formed to fit a kid's hand. Compact, easy to hold and handle, ubiquitous in generic taste and look... nuggets are a perfect, extra-fast food for even the fussiest kids and busiest families. A no-brainer when ordering or fixing a quick meal while on-the-run. Parents feel good about ordering McDonald's Mighty Kids Meals with chicken nuggets, apple slices, less fries, and milk for their children. 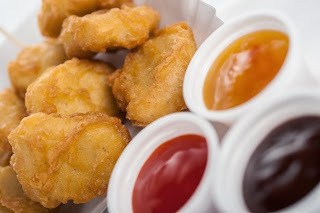 Chicken nuggets are viewed by parents as the white meat alternative to red-meat health concerns, first voiced in 1977 by the federal government. Problem is, chicken nuggets aren't all that healthy. And per a new American Journal of Medicine article, chicken nuggets are made of only about 40% to 50% actual chicken "meat." McDonald's Chicken McNuggets, for instance, contain 25 ingredients, including heavy doses of salt, fat, and sugar, and chemical additives, preservatives, and flavor enhancers. That's before salty, sugary dipping sauces. In short, "stuff that usually ends up in dog food," per NPR. Chicken nuggets would be accurately be tagged as "fat nuggets," commented Dr. Richard deShazo, professor of pediatics and one of the article's authors. Those chicken nuggets you serve to your beloved brood? Not much more than pulverized chicken leftovers (plus a smidge of actual meat), mixed with fat, salt, and sugar, and topped with a big dollop of the usual chemicals found in highly processed, highly profitable meat products. My suggestion? If the kids crave chicken nuggets, a better, far healthier idea is to create them at home. Recipes abound, including more than a dozen delicious, easy, free ideas at AllRecipes.com. 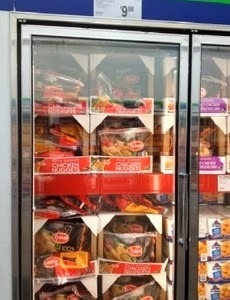 Meanwhile, don't fool yourself that industrial-made chicken nuggets are healthy kid-friendly food options. They're not. Fast-food and supermarket chicken nuggets are just one more fake-food industrial product larded with addicting fat, salt and sugar, and loaded with chemical additives, emulsifiers, preservatives, and fillers. And billions in corporate profits. thank you for sharing this information about dog food. It is good to have the right food for your dog. Have you ever tried reading the fully authentic dog food reviews 2015? Well, you can do it now by clicking some of the best review sites, and know about with the reputable dog food providers in the country.